Yesterday I registered for the Belgrade Marathon and happened to come by the rally of the Serbian Progressive Party to call for elections. The SNS (in Serbian – “Srpska Napredna Stranka) is a political party headed by Tomislav Nikolic. He broke way from the Serbian Radicals, a Nationalist party to form his own party. Nikolic feels that his party can win an election. Serbia has a parliamentary system and elections can be called at anytime. He feels so strongly that he can win that he went on a hunger strike. He was taken to the hospital today. The standing president, Boris Tadic, went and spoke with him yesterday. He does not want to call for elections until Serbia is awarded European Union Candidate status. I am not sure if Nikolic could win an election. He does have several things in his favor. The economy is very bad in Serbia, with high inflation and unemployment rates. In walking through the rally, most of the people seemed to be from outside of Belgrade. In the villages and outside of Belgrade, the economy is even worse, especially in southern and eastern Serbia. Elections during tough economic times usually means a change in government. Nikolic has run for president on four occasions and lost every time. I think he feels that the time is now or never. We’ll see how this plays out. The rally was peaceful. It was a lot of speeches and music, with people standing around with flags. Many were walking around enjoying the sights of the big city. There were literally thousands of policemen on standby ready for violence. It must have cost the government a lot to pay all of those policemen overtime. 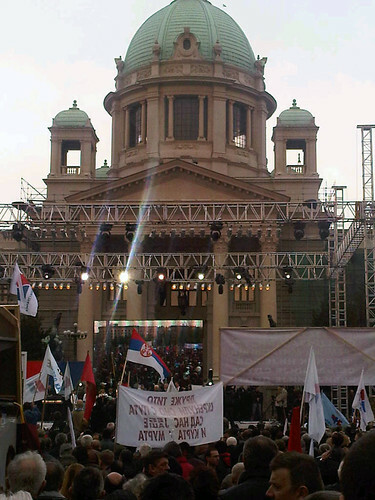 The rally took place in front of the Serbian Parliament building which you can see in the background. The facade is undergoing restoration and it looks really nice. We’ll see if the rally and hunger strike will force President Tadic to call elections. I don’t understand Serbian politics enough to comment on if he should or not. There is a lot of work to do to improve the Serbian economy. I don’t think either party can get it done.